I’ve started participating in an informal bellydance practice within the SCA context as a “guest lecturer series” introducing my SCA friends to ATS® in pure FCBD style. The SCA (Society for Creative Anachronism) has a long history of artistic classes in a “you research, you teach your friends” style for decades. This gives me a fantastic opportunity to “practice how to teach” with close friends of mine in a safe setting. 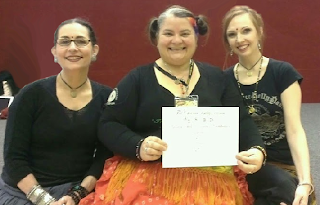 They’ve been meeting weekly for years to share various bellydance styles with one another, and a couple of them have always been interested in my studies over the past several years. It’s been a great opportunity for me to offer something to my friends, give me a reason to develop my own handouts, and give me the hands-on chance to put into practice all my studies for the past three years. As a result, now I’m dreaming about teaching classes. Hours and hours of my morning brain were swirling with classes in the park and an amazing set of women, all having fun together dancing. I couldn’t be happier. And neither could your so-fortunate students!